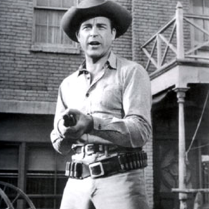 Shotgun Slade western tv show watch free online is an American western television series starring Scott Brady there are 78 episodes originally airing from October 24 of 1959 until 1961. This western TV series was created by Frank Gruber, the stories were written by John Berardino, Charissa Hughes, and Martin Berkeley. The series was filmed in Hollywood by Revue Studios. 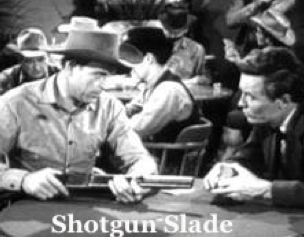 The pilot for the western series Shotgun Slade aired in 1959 on CBS Schlitz Playhouse. 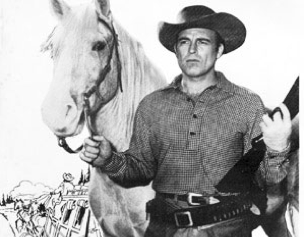 Scott Brady starred in this western series as a private detective for hire. The music is very jazzy which is a departure from tradition for background music for western television shows. 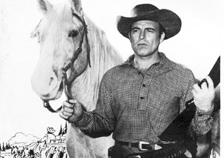 Watch Shotgun Slade western television series episodes free online here on Westerns On The Web. Wild West Toys American made toys. Sponsors this site and rounds up westerns from all over the web for you to watch here for FREE . Here is some Shotgun Slade episodes. Classic western TV series episode shows to watch free. Complete with Cowboy boots, saddles, cowboy hats, Colt 45 smoke, Old West Towns, fast horses, Wells Fargo offices, Stagecoach stations, runaway wagons, outlaws, bandits, Sheriffs, Marshals, Fancy belt holster rigs, guitars, Cowgirls, singers, Levis, campfires, chuckwagons, cattle drives, wagon trains, cactus, Rustlers, Good Guys, Bad Guys, Ranches, Chase scenes, Deserts, Mountains, Forests and everything else great television westerns always kept us entertained with when we were kids growing up and needed good solid Heroes . 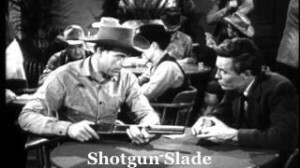 Shotgun Slade Crossed Guns Westerns TV Shows. Starring Scott Brady. With Jazzy Music. Scott Brady, Barry Atwater, Sue Ane Langdon, Rick Turner. A hook-handed gunslinger nursing a grudge lures Slade to Grover’s Bend for a showdown with his fast-drawing young hired kid Billy! But not is all as it would seem! 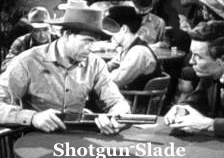 episode of The Shotgun Slade western television show. This show is in the public domain there are 78 episodes. this episode is titled The Deadly Key . Original airing date was March 8 of 1960 . This is episode 23 of season 1. This show stars Scott Brady and is hosted by Bob Terry.